The blackout during the Ravens-49ers Super Bowl was the second-highest-rated program in the Nielsens in 2013, behind the actual game itself. 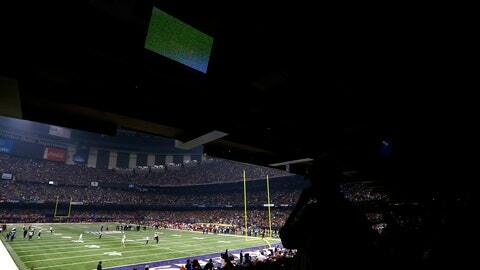 The 34-minute blackout at New Orleans’ Superdome, which was officially labeled "Super Bowl XLVII-Delay," drew 106 million viewers while the game drew 109. The Feb. 2 Super Bowl on FOX already is generating so much anticipation that ticket demand in the New York area is at a record high, according to ticket resellers. "The bottom to the high end of the range is 15 to 20 percent higher than other Super Bowl," Sam Soni, president of PrimeSport, told Bloomberg. "That reflects the demand and also the acquisition costs from the NFL. They’ve gone up as well." Tickets with face value from $500 to $2,600 are going for $2,200 to more than $12,000. "A lot of clients are calling us saying, ‘We don’t have them, but we’re expected to have them and I can’t tell my client I don’t have them,’ especially on Wall Street," said Jason Berger, CEO of All Shows LLC and president of the National Association of Ticket Brokers.